$399.99 & FREE Shipping on orders over $59 $35. 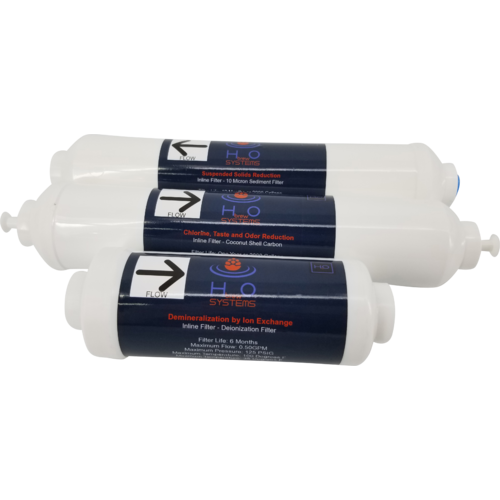 With the BrewRO System you can have access to purified water any time you want without ever leaving the house! 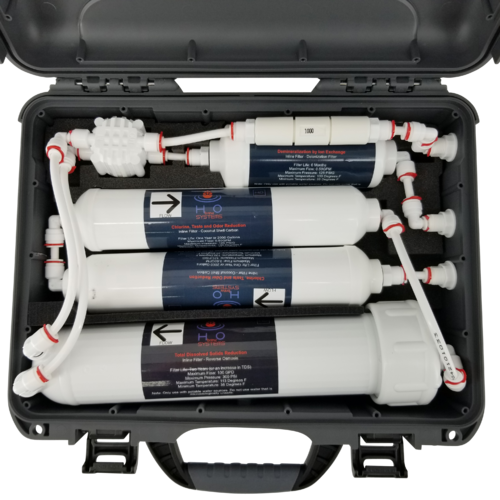 This multistage RO/DI water purification system removes 99.9998% of contaminants in water, giving you a clean slate to custom tailor your water profile for your next recipe. 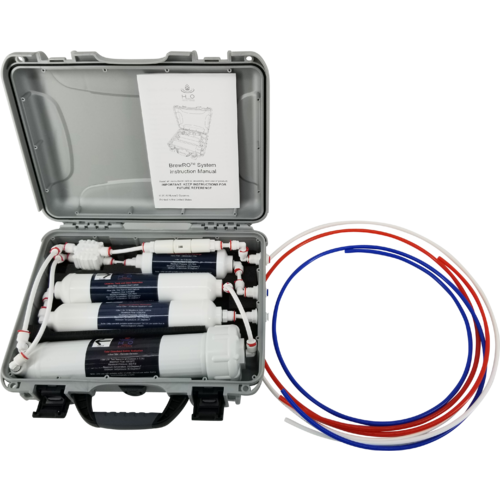 Water produced from the BrewRO system is 0 parts per million total dissolved solids. Now that's pure! Water chemistry is perhaps one of the most important (and most intimidating) aspects of brewing a great beer. After all, water is one of the main ingredients! If the tap water at home isn't up to snuff, you probably find yourself making a trip to the store before every brew day to load up on distilled water. Using distilled water is a great strategy that enables you to build your water profile from scratch. 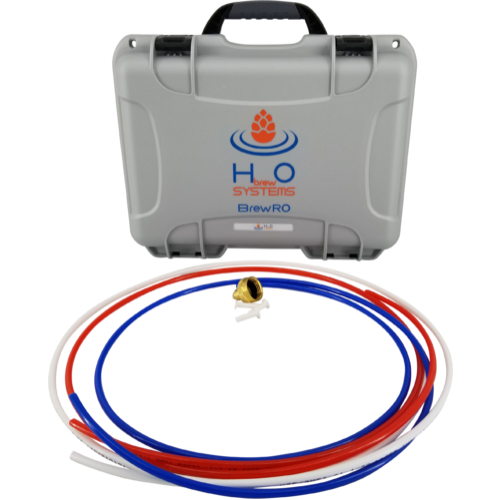 This gives you total control over the water's mineral content and pH, allowing you to create the ideal water profile for any particular style. But the gallons upon gallons of store bought distilled water quickly add up, and only increase the cost of each brew day. 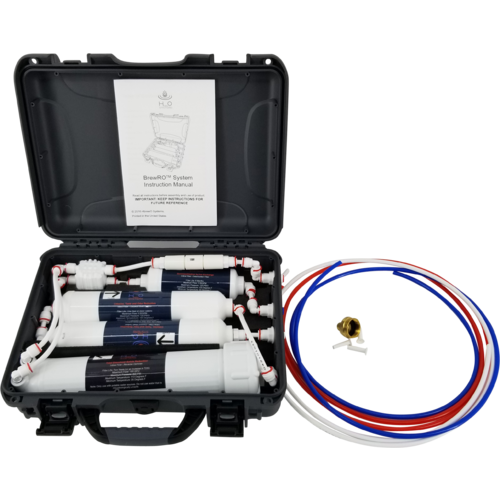 The BrewRO System comes in two configurations for either city water or well water. 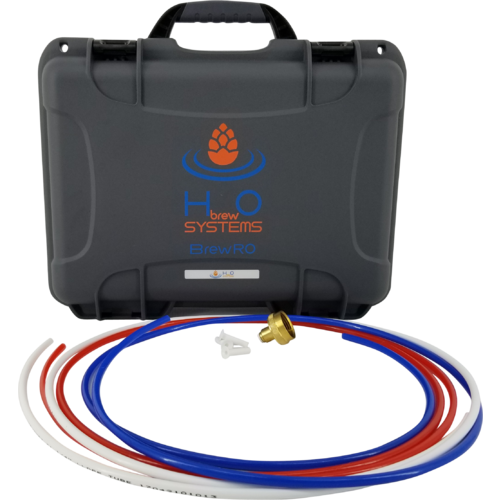 They function the same, but come with different filter configurations depending on your water source. 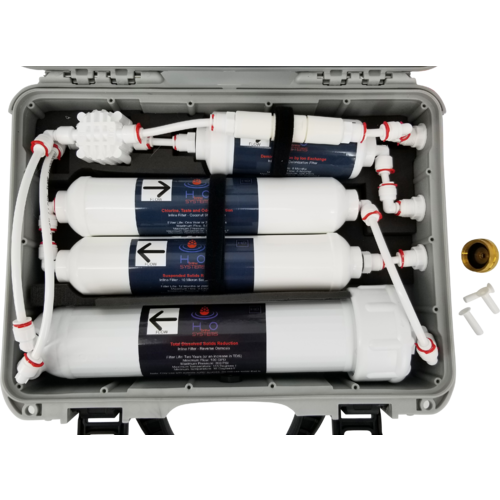 Before entering the deionization filter and reverse osmosis membrane, the city water system runs water through two carbon filters, whereas the well water system runs through a sediment filter and then a single carbon filter. 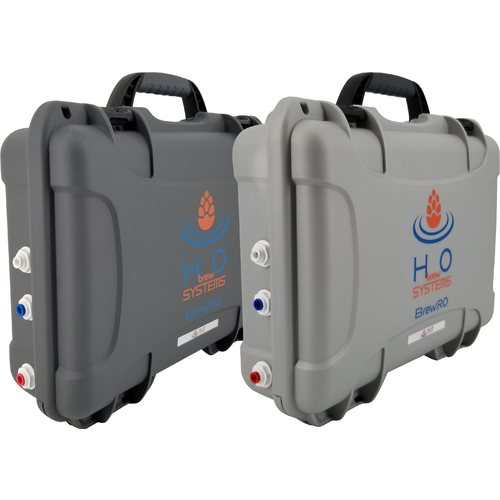 The system is conveniently contained within a carrying case with inlets and outlets built into the side. 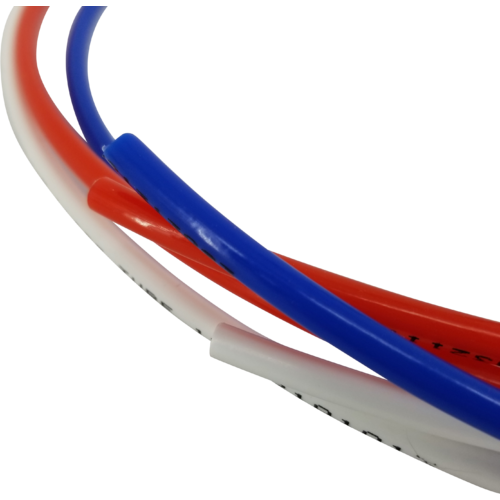 When you're ready to use the BrewRO, simply hook up the white inlet tube to your spigot with the included garden hose adaptor*, run the red "rejected water" tube to a storm drain or water reclamation bucket, and run the blue "treated water" tube to your collection vessel. It's that easy! 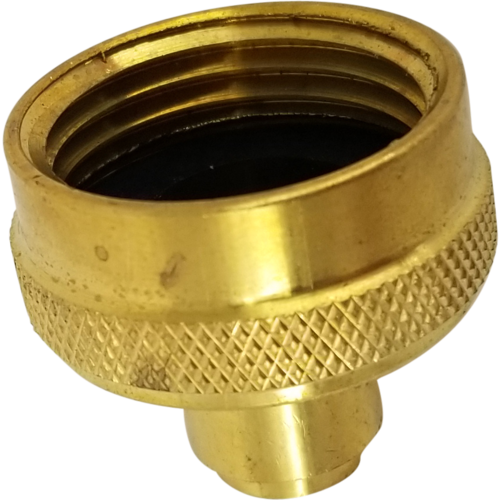 *Faucet adapter and other accessories are available. See below under You Might Also Need. My water source changed from good water to I can not brew with this. The BrewRO allowed me to source water in my own home. Waste water is now stored in a container for cleaning and cooking in the house. Nothing wrong with the waste water, just not used for brewing. Water profile is treatments additions away for what style I am brewing. Since my water isn't that bad, I use this to build my water up from scratch, this unit works beautifully for that. Instructions are easy to understand, unit is easy to use and its portability is a great plus. I am surprised at how small the case is, which is not a bad thing. Word of Warning: I have decent water pressure and my collection rate is well under 4 gal/h, more in the range of 2-3 gal/h. Not a big deal, but be sure to plan your day right and you'll enjoy it as much as I do. Very clean water with bad city water going in. I bought a system direct from the manufacturer and have been using it for 13 months (45 brews) now. Very simple to use - Line in results in Filtered and Waste water outputs at about a 1:3 - 1:4 ratio. I love the convenience of capturing my own RO water. I opted for the TDS meter to track the wear on my filters as well as the faucet adapter. Both are very helpful and help facilitate my brew days. Shipping from the manufacturer isn't bad, but coming from Georgia to California my last filter replacement order was ~6 business days between order date and delivery. MoreBeer's quick shipping makes it an easy decision to continue using this system and I know where my next filter replacement orders will be filled! For those wondering about the waste water - Instead of running it down the drain I capture it in a MoreBeer bucket and use it to water the plants in the back and front yards.